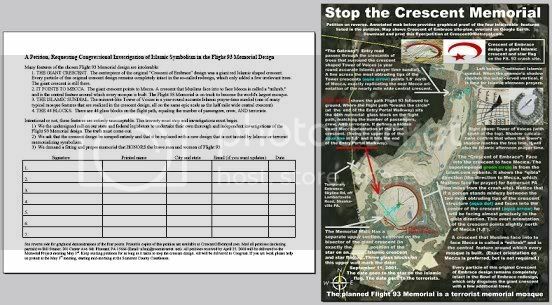 Petition page: Stop the Flight 93 Memorial! 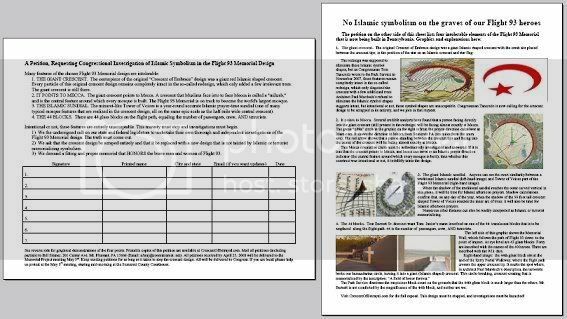 In March 2008, Bill Steiner and his Western Pennsylvania Compatriots put together a petition to circulate on the ground in Pennsylvania, calling for Congressional investigation of the many examples of Islamic symbolism in the Flight 93 Memorial design. I added an electronic petition (hosted by ipetitions.com), and I put together a couple of combination flyer-petitions. Paper petitions should be mailed to Bill Steiner, 133 Center Ave. Mt. Pleasant, PA 15666 (email: n3auj@zoominternet. net). Mailing instructions are included on the printed petitions. Copies of all petitions received by the end of April, 2008 will be delivered to the May 3rd public meeting of the Memorial Project in Somerset PA. By the August public meeting, we hope to deliver a much bigger stack of signatures, and so on for as long as it takes. All petitions will eventually be delivered to Congress, and to the Pennsylvania state legislature. Tom Burnett Sr. and I also put together an appeal from Tom to the American people to please consider signing our petition. A version with hyperlinks is suitable for copying and pasting into email, or posting online. 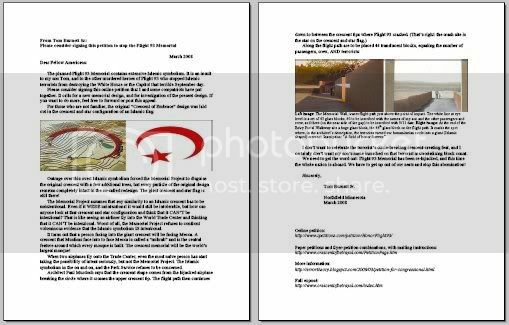 A paper version (without hyperlinks) can be printed out (back and front) as a complement to the paper petition. Print page 1 (by clicking the print icon in the acrobat browser page), then turn it over and print page 2. This map is a high resolution image (300dpi), so it you have a decent printer and decent paper, it will come out very clear (photo-quality is awesome).